Helen, Sharon and I decided while on our way back from the Harrogate show that we would like to extend our skills a little so then arranged to have a Block of the Month Quilt Along. Several other people from knitting group have also joined in. So that was yesterday afternoon’s little project. Helen is co-ordinating it and after discussion we decided to use this Quilter’s Cache site run by Marcia Hohn which has a huge number of patterns all at the same size and a random number generator to choose blocks. We thought this was a good way of extending all our skills as then we would avoid just choosing easy blocks. Helen has been quilting for a long time, Sharon has just started and I am in the middle in terms of experience (and fabric stash lol!). This month the block is Dutchman’s Puzzle which involves Flying Geese. 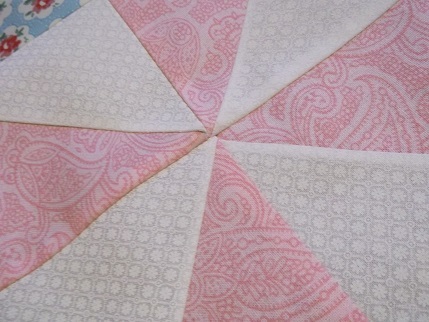 I remembered that I had seen some videos on how to make these so being better at visual rather than written instructions used this very useful McCall’s Quilting video on You Tube to make them using the ‘no waste’ method. 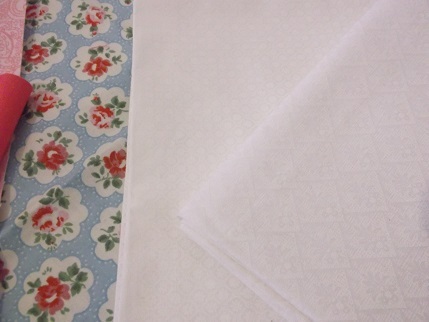 That did include choosing the fabric though which took a while. I tend to buy fabric in small amounts and as we will be making 12 blocks of unspecified patterns had a bit of difficulty with what to choose. In the end I went with a colour palette that I have used for previous things with the addition of some of my new stash from Harrogate (the Cath Kidston look-alike flowers on aqua in these pictures). The solids are far more pink than they appear here (winter light upstairs not good for pictures!) and I do have a few more options that I can add. 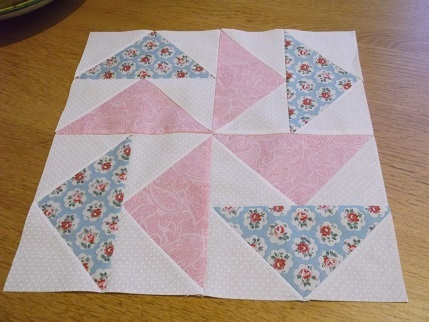 The white on white fabrics are really too subtle to see in this picture but they show up better in the finished block. 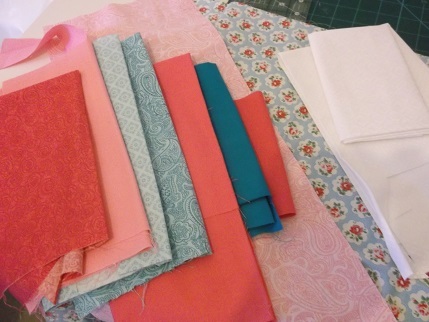 It was a good experience though as I tend to buy either fabric for specific things or stuff that I like the look of but not much of it co-ordinates with anything else apart from my lovely Simply Solids stash. 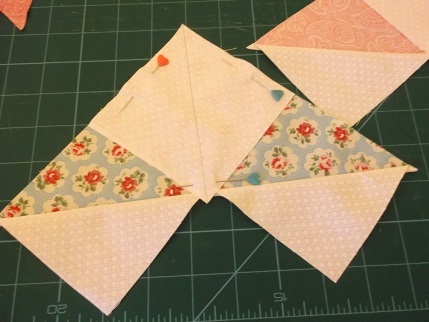 I have to think about the fact that future blocks may be more scrappy so that ruled out lots of larger prints and that as I am trying to do it all from stash what am I going to use for binding, sashing and backing? What I may do is make 6 of the blocks from this set of stash and six from another set if I run out. These will probably become donated quilts as I have plans to make others for family this year. I was very pleased with my end result and the process was very simple to understand, good practise as well at sewing 1/4 inch seams. The finished block has turned out a bit big but am pleased with the points at the centre and have only lost the nose from one of the geese! It was an easy block to make and the video was very useful. Our aim is to make as many of the blocks as we all can (given busy lives) so no-one will be penalised for missing a month and we can use our regular meetings for knitting group to help each other out. 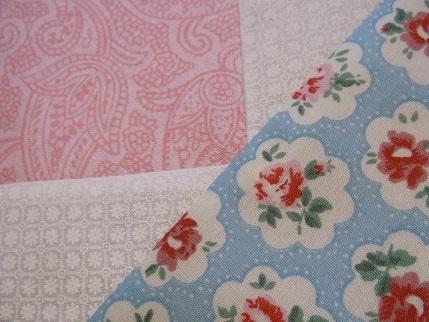 There will then be a couple of quilting bees I should think when we tackle basting, binding and machine quilting. 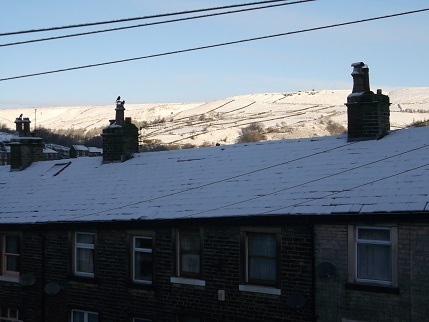 After all that snow yesterday I awoke to this beautiful view – sunshine on the sparkling hills, if I wasn’t just getting over a yucky cough I would be out for a wander but I will stay in the warm and admire the views from here. Hope you have also had a nice weekend, thanks for visiting.